Heard scratching and skittering coming from the walls or ceiling? 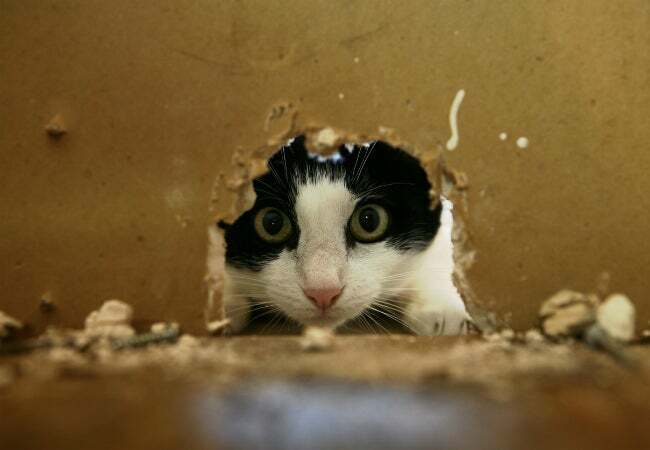 Evict any mice in the walls by following these key strategies. Q: For the first time in my life, I have mice. I had thought that I dreamed the scratching and skittering sounds I heard coming from the walls and ceiling, but then I eventually found the quarter-inch droppings. So far, these critters seem out of reach—I’ve only seen one scurry through the kitchen—so what’s the best way to deal with mice in the walls? A: It’s no surprise you haven’t seen much of these pests just yet: Mice that take up residence in your walls will often stay in their nests during daylight hours. You’ve already done well by using the available clues to identify exactly the type of pest you’re housing—mice, as opposed to raccoons or squirrels—and this knowledge will guide you in selecting the most appropriate means to get rid of them. 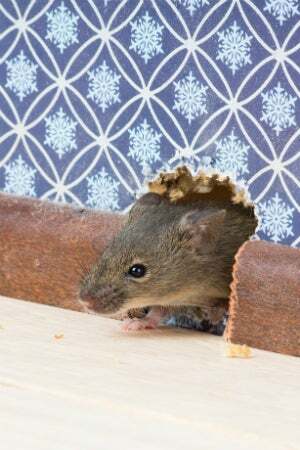 If you’re at all uncertain, look for the other signs you’ve got a mouse problem, such as nickel-sized holes in the walls, baseboards, and floors and teeth marks in these areas. Lure them out. Mice will emerge from your walls in search of food, and that’s your best window of opportunity to catch them. Bait multiple traps with peanut butter or cheese, and place them wherever you’ve found mouse droppings, especially under sinks, inside drawers, and behind furniture. (Whether you prefer to catch and release with a live trap or solve your problem with several snap traps is a personal preference.) Then, check the traps daily—twice a day, even, if you’re using a live trap, in order to release it as soon as possible. • Traps with live mice should be put into a heavy-duty plastic bag (cage and all) and carried to a forest or park at least 500 feet away from the home so that they cannot find their way back. • Dead mice can be deposited into a plastic bag to take out with the trash or directly into the outdoor garbage can. If you’re too squeamish to undo a snap trap to release the dead mouse, you can also dispose of the whole snap trap at once. Fortunately, the wooden spring traps are affordable enough to be disposable. Of course, it won’t often be one-and-done: Keep your guard up and continue to check the remaining traps for a couple of weeks following your first catch. Use rodenticides with caution. Poisonous pellets only sometimes solve a mouse problem—some mice can actually be resistant to arsenic or anticoagulant poisons like warfarin—and they do come with a number of consequences. In a best-case scenario, a mouse or two carries the pellets you’ve strategically placed, carries it back to the nest, and one or more die inside your walls. You’ll no longer worry about mice but may get a whiff of something unpleasant in your home several days after the deed is done. Worst case scenario? The deadly chemicals geared toward rodents are found and ingested by children or four-legged friends. If you choose to proceed with poison, place pellets in a tamper-resistant bait station (typically a large black box with one entrance and the poison deep inside) to prevent any accidents. Locate the station nearest to potential food sources for the mice and still out of reach for domestic animals and children. Remove any distractions from your baited traps. To help direct the mice in the walls toward your trap, take away any other potential food sources. Keep trash can lids closed tight, clean up spills in the kitchen and dining room immediately, and make sure all food is stored in airtight containers. Stop leaving fruit, candies, and any cardboard-encased snacks out on your countertops, of course, but also consider your pantry. It’s best to follow the same practices behind these doors, or—at the very least—inspect the cabinets to make sure they’re totally inaccessible. Plug all holes. Mice are sneaky little creatures that can fit through holes smaller than a quarter in size, so take the time to search the entire perimeter of your home—floors, baseboards, corners, and more—and seal off any cracks or openings you find using a larger piece of steel wool. Though they may try to burrow through it, steel wool with a reinforcement of caulk makes a strong barrier. (Filling holes before you’re certain you’ve trapped or poisoned all of the pests, however, means you do run the risk of trapping mice in the walls with their nests and leaving them to die and decay out of reach.) During this same inspection, it’s also a smart to repair any compromised weather stripping around windows and doors and cover your exterior vents with hardware cloth so you don’t invite any additional pests in. Keep them away. Bolster your defense against future infestations in your walls by picking up rodent deterrents. Your local hardware store should carry a range of options designed to send mice scurrying away rather than kill them. If you’d rather make your own to repel unwelcome invaders, just combine three cups of warm water with one teaspoon of peppermint essential oil in a spray bottle. Use this DIY mouse repellent spray or leave out cotton balls dipped in peppermint oil wherever you suspect mice are liable to come sniffing (sealed-up entrances to the house are a good start). One whiff of peppermint and these rodents swiftly turn away and find somewhere else to roam. As a bonus, your home will smell minty fresh—a little aromatherapy in exchange for your trouble. You can put smells to work outside the home, too: If you have a cat, sprinkle some of Fluffy’s used kitty litter around the exterior edges of your home once a month or so to frighten mice away with the scent of a predator.